This week is was our turn for Breakfast Club at work. Originally I was going to try and do breakfast pizzas, but Minion wanted to bring in breakfast burritos again (he does this regularly so sometimes I call him Burrito Man). I felt that pizza AND burritos for breakfast was overkill. What to do instead? I poked around in the freezer and found what I thought was mango (it wasn’t) and decided to make a banana bread. With mango. But actually it was jackfruit. 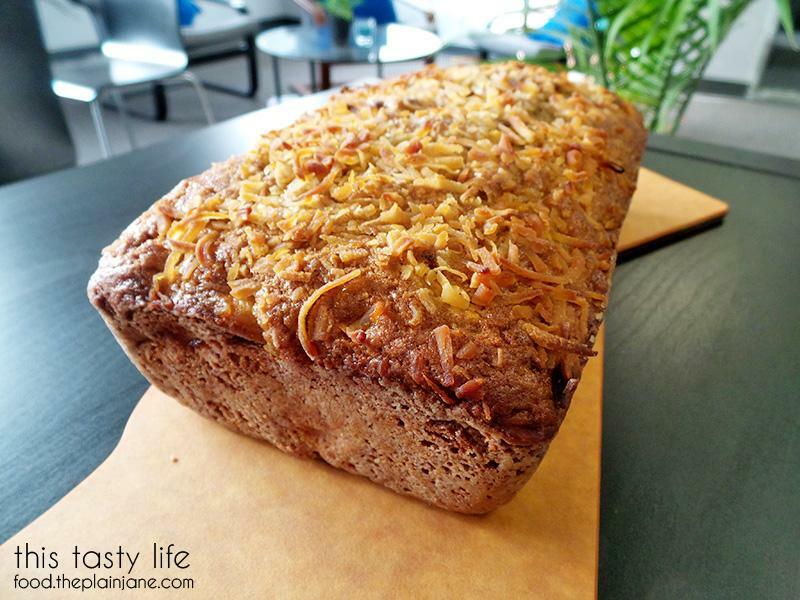 And that’s how Jackfruit Banana Bread came about! I wanted to give this bread a nice tropical feel with the jackfruit so I ended up incorporating some key lime and coconut. 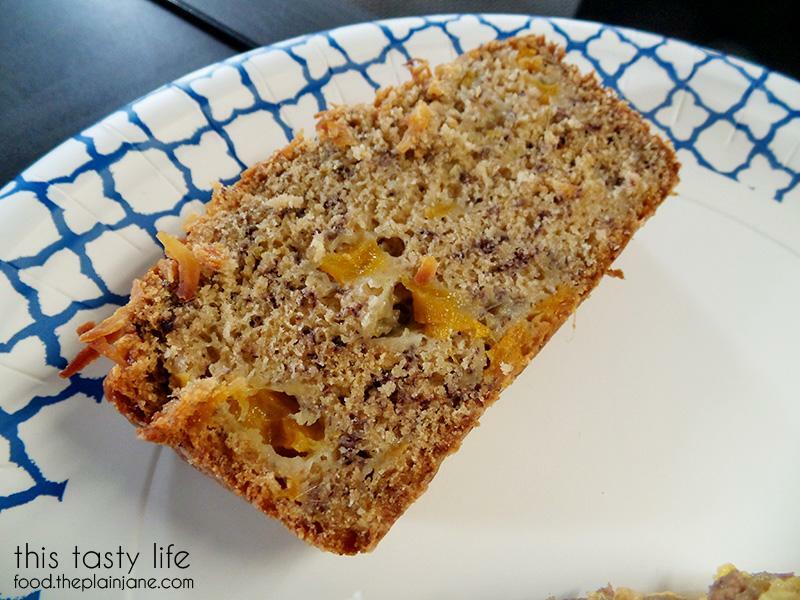 I used this Peach Mango Coconut Oil bread from Averie Cooks as my base and then just changed up some of the flavors. Which then made me think of that “Lime in the Coconut” song. I may have hummed the lines of that song to myself while making this bread. Ahem. Anyway. I thought briefly about putting coconut into the batter along with my coconut oil… but then I decided to only put it on top. I don’t really like it when things have a ton of coconutty strings all over the place. 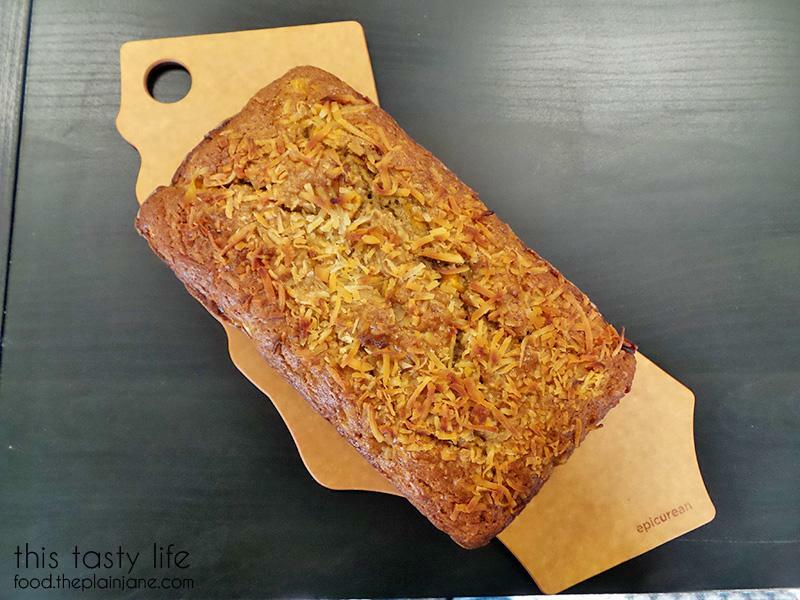 The only thing I think I would add to this Jackfruit Banana Bread would be nuts. Maybe some nice macadamia nuts to keep in line with the tropical-ness of it all. The bread turned out to be very moist which I was very happy with. It’s a touch sweet but I think the lime helps balance that sweetness out a bit. 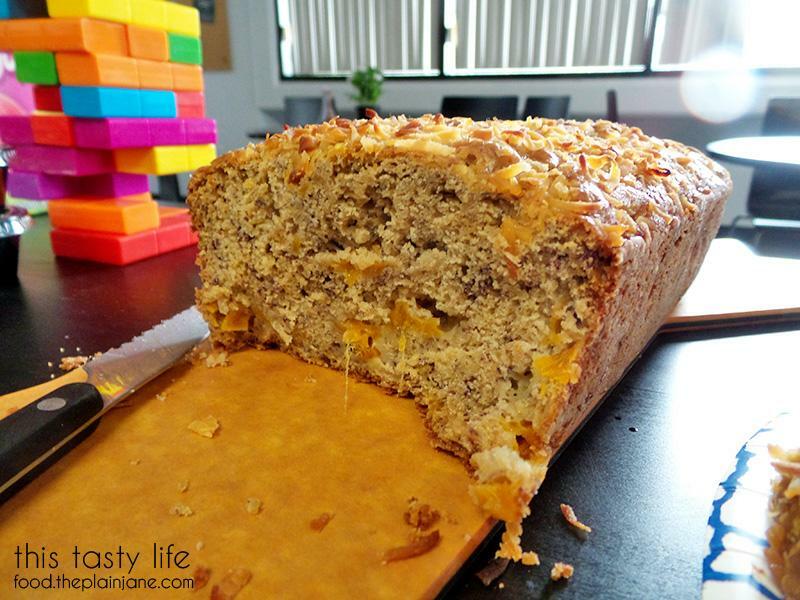 My co-workers gobbled up this Jackfruit Banana Bread in no time – there was only half of a slice left at the end of the day! If you’re wondering, you can get jackfruit at the Asian markets like Seafood City or Lucky Seafood (in Mira Mesa). It’s a huge big old fruit but you can also buy it canned if giant fruits frighten you. You can also easily substitute the jackfruit for something else – like that mango, or even other stone fruits like peaches, plums, or apricots. Get crazy with your banana bread and make it unique! Preheat oven to 350 degrees. Prep a 9x5 pan with cooking spray + a dusting of flour. Or if you're fancy, use a floured cooking spray! In a bowl, sift together the flour, baking powder, baking soda, and salt. Set aside. In another large bowl, add eggs, coconut oil, sour cream, brown sugar, and white sugar. Whisk to combine. Add mashed bananas, lime zest, and lime juice. Add dry ingredients to the mix and stir until just combined. Don't overmix! Dust your diced up jackfruit with flour and add it to the batter. Carefully flood the jackfruit in until just combined. Add batter to your prepared pan. Sprinkle the shredded coconut flakes in an even layer on top of the batter. Bake in the center rack of your oven for about 30 minutes. Then add aluminum foil on top so the coconut/top doesn't get too browned. Bake for additional 30 minutes. Test your bread - if it a toothpick comes out clean then you're good to go! I usually check about 5 minutes earlier to test for doneness. Be sure not to overbake your delicious bread! What a great recipe incorporating Filipino flavors! I LOVE jackfruit! I like that you paired it with banana since those two flavors are usually found in turron (dessert lumpia). I usually buy my jackfruit canned but have seen it fresh at Miramar Cash & Carry (they don’t have it all the time though) and that Fruit Shop on Convoy (in the stripall with Iceskimo), plus Seafood City. 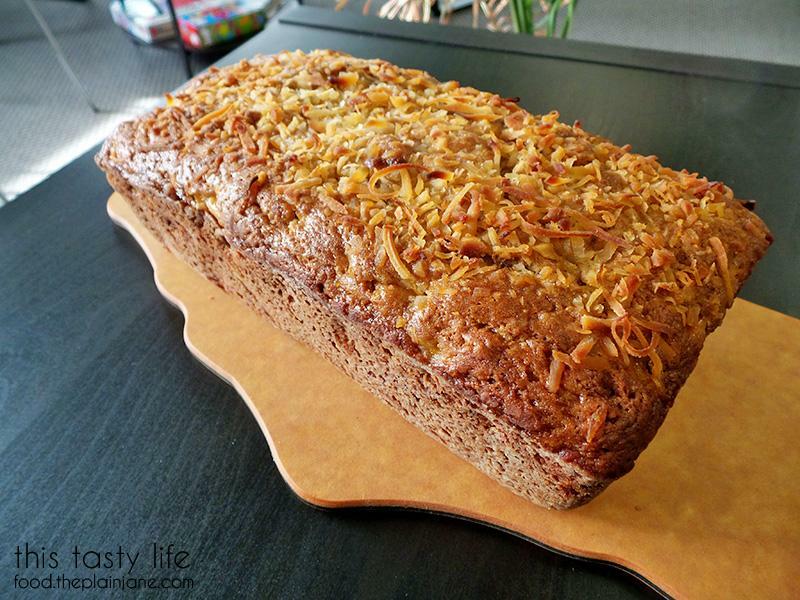 Have you thought about making this bread with macapuno (coconut strings)? I’ll have to make this recipe once I get some coconut oil and jackfruit. Hi CC – This recipe was kind of a whim, I didn’t think about using macapuno but I met it would be good in this bread! My mom got the jackfruit from a neighbor and the jackfruit was so sweet and tasty. Thanks for the tips on the other places to get it!